The Master & Dynamic MW07 true wireless earphones are our favorite cord-free earbuds by a massive margin. They’re also really, really expensive. If you’re looking for a good pair of truly wireless in-ear headphones and you don’t want to pay an arm and a leg, turn to the internet hive mind for answers. 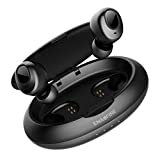 The ENACFIRE E19 True Wireless Bluetooth Earbuds are the best-selling cord-free earbuds on Amazon for a few good reasons, and at $48 they offer a value the likes of which can’t be beat.